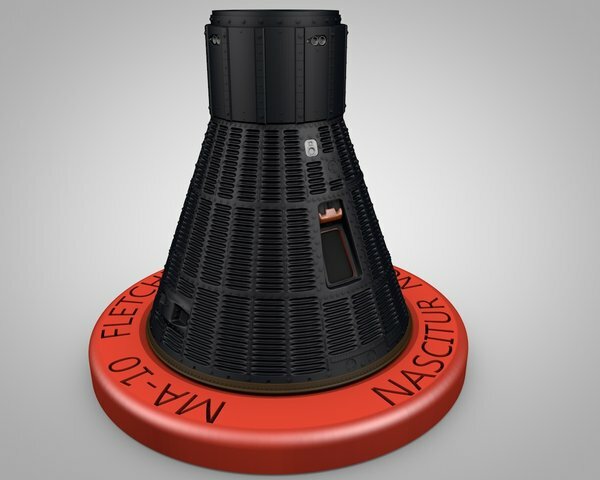 By Sean Charlesworth on July 14, 2015 at 12:55 p.m.
For a short film production, I was tasked to design and 3D print a Mercury capsule and escape tower. Shortly before this past Christmas, I was contacted by Lauren Oliver, an extremely polite gentleman who had discovered my Buckaroo Banzai Jet Car on The Replica Prop Forum. He reached out to inquire if I would be interested in building a NASA Mercury space capsule for a short film he was writing and directing. I was most definitely interested. 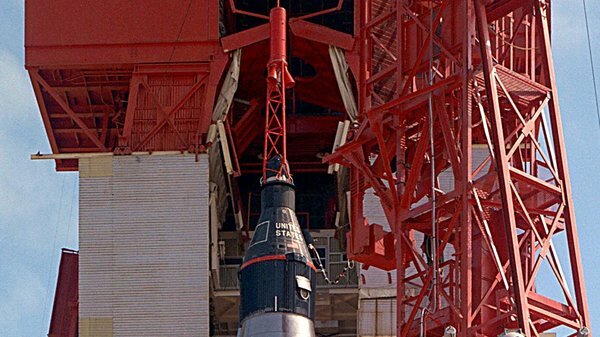 Lauren's short film, "T-Minus", is a fictional account of the 7th manned Mercury mission, which was cancelled in favor of moving on to the Gemini program. His plan was to shoot on 35mm film, using nothing but scale models and practical effects. My background is in film production--almost everything I ever shot was on film and I grew up in the 70's and 80's (the heyday of practical effects). This was my kind of project! 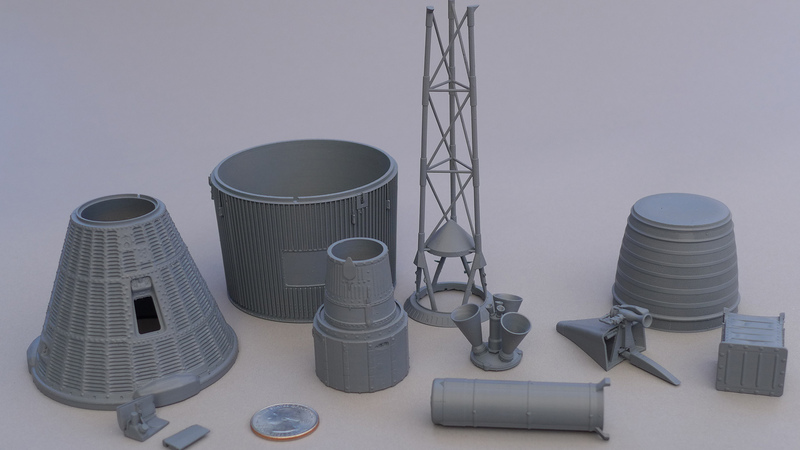 For the film, Lauren intended to build a 1/24 scale Atlas rocket, including the launch gantry (more on this later) but needed the capsule and other parts made. My initial response was, "not to put myself out of a job, but can't you just use an existing model kit?" --I figured there must be a ton to choose from. There are, in fact; that was his original intention, but none were detailed enough and/or at the right scale. 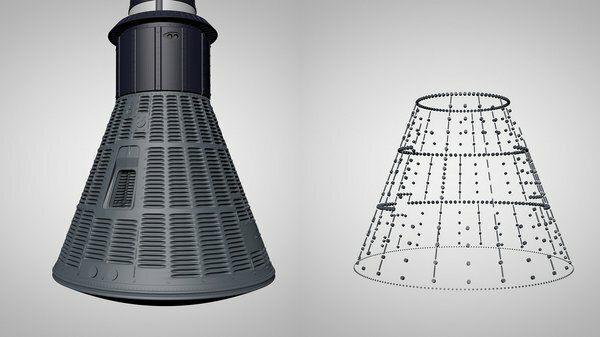 I have to confess, I know more about Star Wars ships than I do about our real-life NASA fleet and there are as many Mercury capsule versions as there are TIE-Fighter models. So, I was very pleased when Lauren presented me tons of reference photos, blueprints and detailed the differences between them all -- he knew his stuff. Interestingly enough, at the time he was not aware of Tested and all the space goodness that goes down here--but I made sure to fill him in. 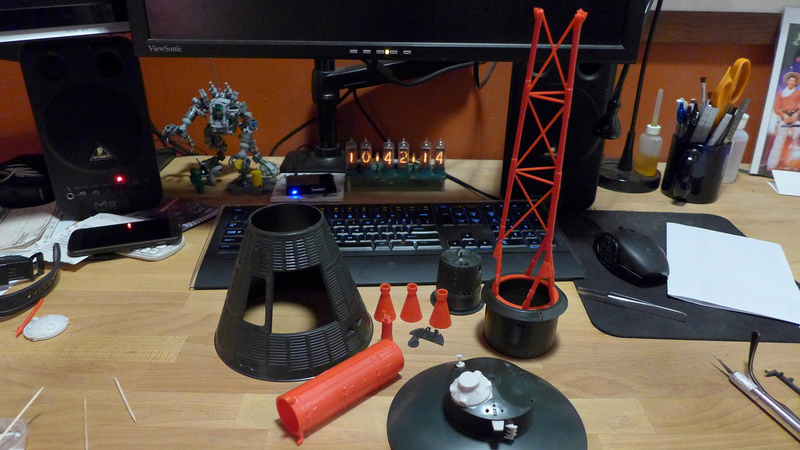 My job was to build the capsule, the escape tower (the red rocket assembly at top), and the adapter, which attached the whole thing to the Atlas rocket. With my hoard of blueprints and photos, I imported diagrams to Cinema 4D to use as building reference. I modeled everything at full scale so I could simply enter direct measurements from the blueprints and scale down the finished model for printing. 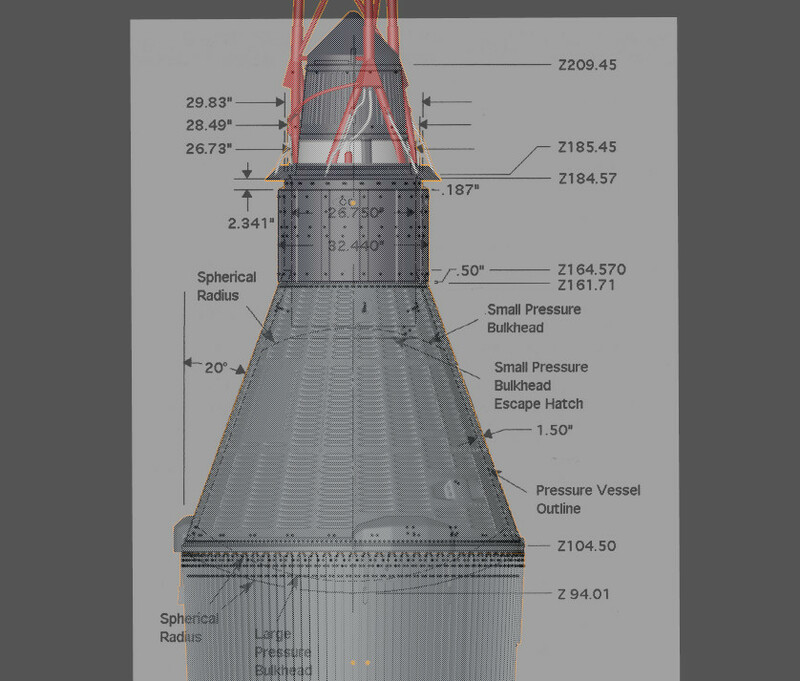 But, even with the blueprints, there were many details that had no dimensions listed. Rather than trying to estimate measurements using Photoshop, as I did for Adam's Hellboy Motivator, I decided to find a physical reference. I ended up with an Atomic City Model Engineering 1/12 scale kit, that enthusiasts indicated was the one to buy. 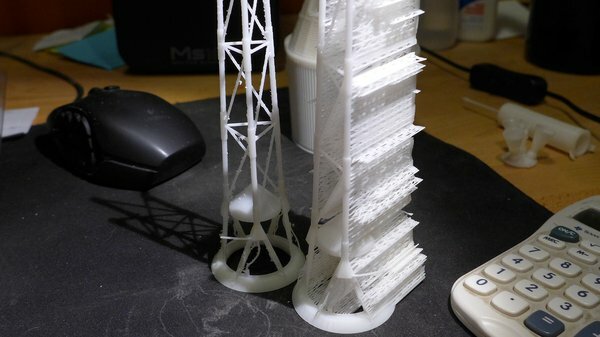 It turned out to be the exact one Lauren had originally intended to use for his rocket, until he realized that at 1/12th scale the entire structure would be over 14 feet tall! Having a physical reference to work from was a great help and aided in not only measurements, but part layout, as it wasn't always clear from the blueprints. I could simply take caliper measurements from the kit and scale them up for the 3D model. Having a physical reference from an existing model kit was a nice change of pace for this project. With so many parts, it can be hard to decide where to start. Sometimes, I will pick an easy bit to get in the groove. But lately, I have been picking problematic pieces first. It can be a frustrating way to start, but once that hurdle is cleared, you know everything else will be easier. Another good reason for this approach is, sometimes, you discover that a problematic piece will require rebuilding parts you have already done. Getting the troublemaker out of the way early can save work down the line. A single panel is made and put into an array. I immediately knew my problem child was going to be the corrugations on the capsule. It's the capsule's most distinctive feature. 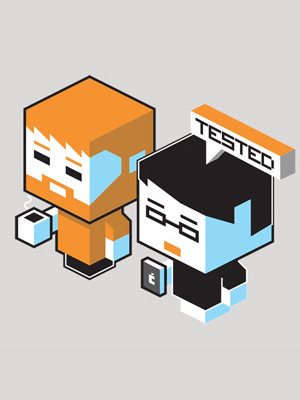 There's lot's of them and they had to be perfect, or the capsule wouldn't look right. I lost track of how many iterations I did (at least six) before finding the 'easiest' way to build the corrugated panels. 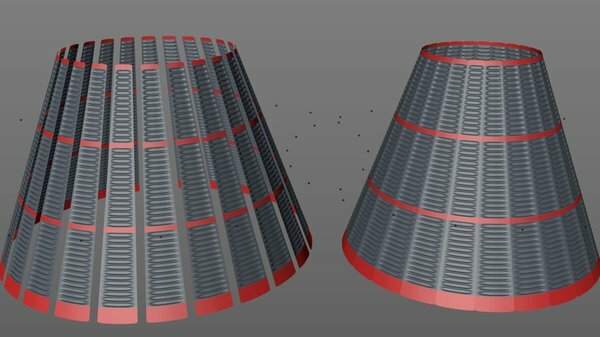 Ultimately, I designed a base panel that could be duplicated in an array and used for most sections, to make up the skin of the capsule. After all the prototypes, I built the first 'official' panel, only to discover I miscounted and didn't have enough rows of corrugation. Sigh. Sometimes, you can go back and fix these mistakes, but often it's easier and faster to just build it again. Each version comes together faster than the last, and even though it was tedious, it was true in this case. With the fixed panel as a base, I made the array and edited each panel to match the blueprints and then finally joined them together to make a complete body. 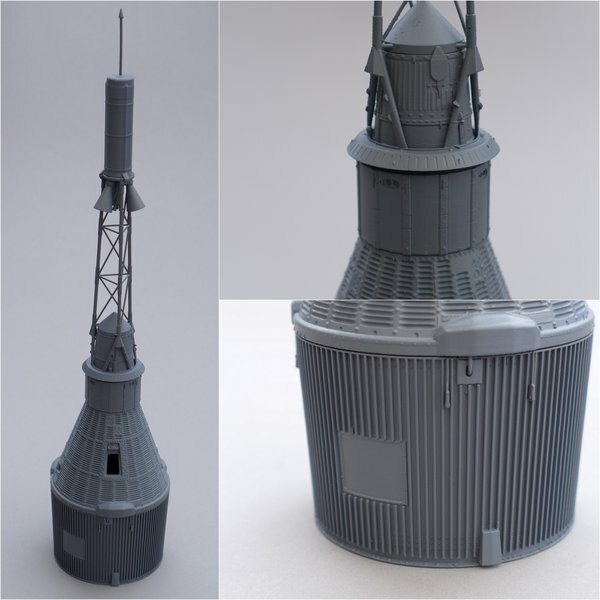 Once the capsule base was done, all the details had to be built--a lot of them. This was different than something like Adam's Hellboy Motivator, which didn't have as many details, but had to function mechanically. Most of my time with the Motivator was figuring out how things would go together and work. 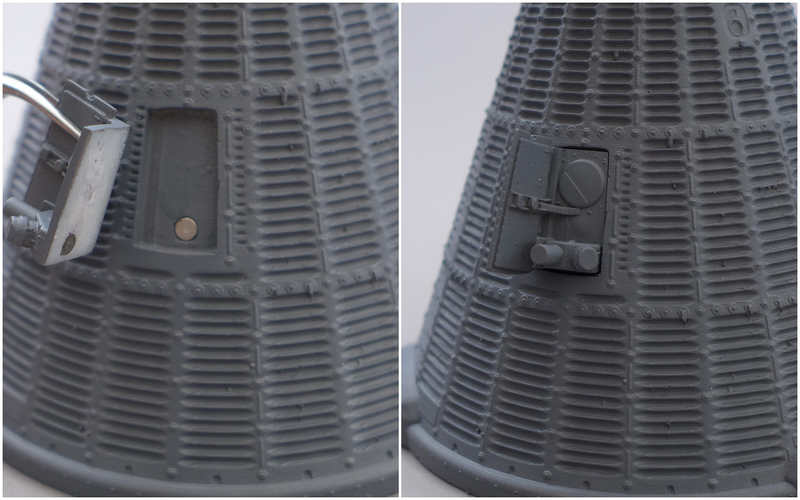 The capsule wouldn't have many separate parts to assemble, but each part had a ton of detail that needed to be built accurately, like the almost 1,000 rivets on the finished model. While I could use functions within the modeling program to make this easier, I still had to manually place each column and row. 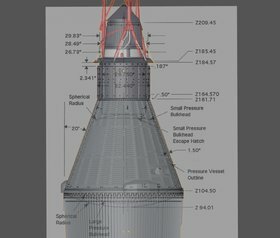 I also had to figure out how the parts would assemble, keeping in mind how they would attach to the rocket body that Lauren was building. There was a constant stream of emails confirming details, assembly methods and most importantly the scale of parts. Since many measurements came from using callipers on the 1/12 model, slight discrepancies could happen that became large ones when scaling up and down. 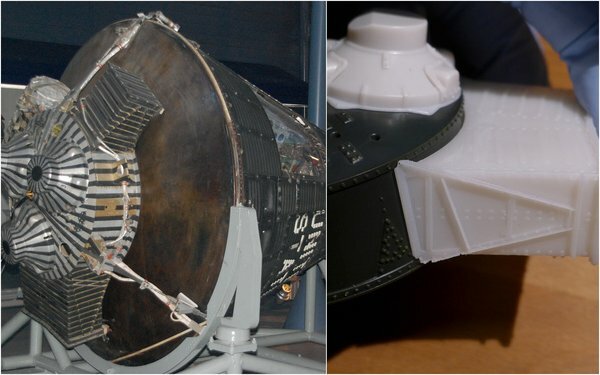 When building the Motivator, anything that was an individual part on the original, was modeled and printed the same. The challenge with the Mercury project was deciding what should be a separate piece and thinking ahead during the modeling process to accommodate that. 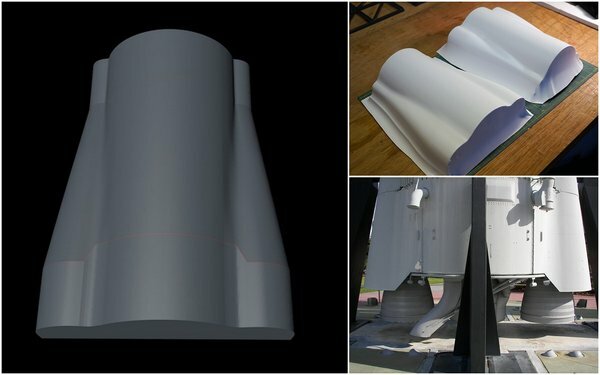 The breakdown was determined between consulting with Lauren on how it needed to attach to the rocket body, and the best way to print it, considering cost and clean up. Cleaning tower supports was a challenge. I designed almost all the parts to be hollow, as it greatly reduces the printing cost. 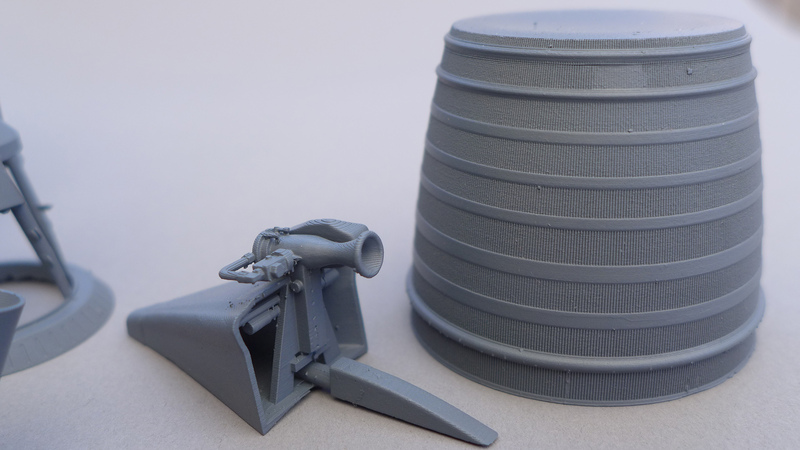 The body of the escape tower (red structure on top of the capsule) was designed to print solo because the printer supports would be tedious to clean off. For the rest of the parts, I designed a slot and key to align them properly when assembled. The finished assembly stands slightly over 14" tall and has a removable hatch that can be replaced with the launch umbilical attachment via neodymium magnets. I also ended up building the main and vernier engines to be used on the rocket body and CNC bucks for vacuum forming the engine fairings. 3D model used to CNC bucks for vacuum forming. Adds-ons for 1/12 model kit. Additional compartments were built to attach to the 1/12 scale Atomic City Engineering model. Lauren intends to use it as a prop in the film and the compartments were needed to make it accurate to the Mercury 10 mission capsule. Over 160 hours and almost 1,000 rivets later, this has been one of the most intricate projects I have tackled and couldn't be more pleased with the results. We will be doing a few hand-painted 1/48th capsule prints as one of many "T-Minus" Kickstarter rewards. 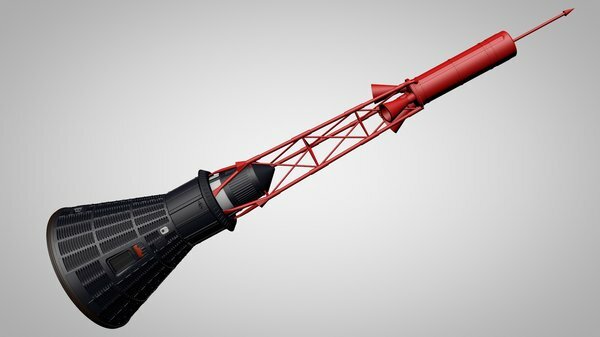 Stick around for a write-up on the physical build of the Atlas rocket for this film! You can learn more about the film itself and even help it happen by checking out the "T-Minus" Kickstarter going on through the end of the month.